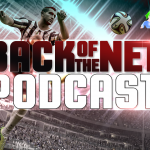 Welcome to Episode 89 of the Back of the Net: FIFA Podcast in partnership with Sweetpatch TV, which is now recorded live on Google Hangouts so you can now watch and listen. This is your weekly FIFA, Sports and Banter Podcast. This week we ask if FIFA 13 Ultimate Team is over and discuss lots of other stuff. We hope you listen and enjoy. Thanks for listening and watching and we look forward to seeing you next week for the next episode of Back of the Net podcast.